The Adtran MX2800 series includes M13 and STS-1 multiplexers that meet the most stringent carrier class requirements. As with all Adtran products, the MX2800 series offers comprehensive management and configuration options. The MX2800 offers bandwidth consolidation at a low price and in the smallest footprint available in the industry. The equipment meets stringent NEBS Level 3 requirements and is backed by a 10-year warranty. Measuring only one rack unit high in 19-inch or 23-inch rackmount configurations, this compact device gives NSPs and enterprise users a powerful tool for consolidating 28 T1 signals or 21 E1signals into a T3 circuit. Additional Information: Consolidates 28 T1 signals or 21 E1 signals into a T3 circuit. 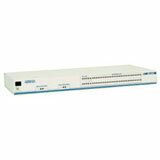 The Adtran 1200290L1 is also known as ADN-1200290L1	.